**Important** Press Release - Fair & Lovely Foundation invites applications for Scholarship 2012 - Glitter & Gorgeous!! Mumbai, October 1, 2012: Fair & Lovely Foundation since inception in 2003 has played an integral role in changing the lives of more than 1100 girls; given them wings to achieve their dreams by empowering them through education and career development. Continuing their passion and determination in the 10th year, Fair & Lovely opens doors of hope for girls across the country to pursue their dreams. The Fair & Lovely Foundation is an enterprising initiative by Fair & Lovely, the leading fairness cream brand from Hindustan Unilever Limited, offering scholarship to empower the women of tomorrow. Fair & Lovely Foundation in its mission of ‘adding vitality to life by making women look good, feel good and get more out of life’ has garnered support from renowned Indian woman from all walks of life consisting of successful educationists, NGO activists etc. who all work towards a common objective of woman empowerment. Ms. Kum Kum Roy, Assistant Director-Worker, Sahara India Parivar, who’s been an integral part of the advisory boards says, ’This is a wonderful initiative by Fair & Lovely Foundation to help genuine and needy girls fulfill their dreams’. Dr. Fatema Vasanth, Principal Madras School of Social Work, who has supported Fair & Lovely Foundation through the years, says ‘I appreciate Fair & Lovely Foundation for making education a strategy to empower women’. One of the 2011 scholarship winners, Diana, who lost her father to a heart attack 4 years back almost halted her ambition and progress mid-way. But she persevered by continuing to study hard that got her a seat to pursue studies in her chosen field of Architecture. “I had given up hope for pursuing Architecture but after I received the Fair & Lovely Foundation Scholarship I am confident that I can now overcome my financial challenges to gain excellence,” says Diana. Like her, the Fair & Lovely scholarship program has played a major role in the success of many young aspiring girls by awarding them with scholarships pursue higher education. The aid is given to promising young girls, who have the grit and determination to overshadow every challenge and obstacle in transforming their lives. Adding value to the lives of these girls are eminent icons and educationists like Padma Shri Manju Sharma(President of the National Academy of Sciences), Sneh Bhargav(Distinguished member from the medical profession in India for the National Knowledge Commission), R Venkat Rao(Vice Chancellor National Law School of India University), Naini Setalvad(Nutritionist and Health and Obesity Consultant), Padmavati Bandhopadhya(First lady Air Marshal), Alokananda Roy(Dancer), Smita Bansal(TV Actress), Dr. S Shanmugavel(Registrar Anna University), Prof. Sukhadeo Thorat(Chairman, Indian Council of Social Science Research and Former Chairman University Grants Commission), Ms. Harshini Kanhekar(India’s first woman firefighter), Ms. Santosh Yadav(Mountaineer), Mrs. Shahida Parveen Ganguly(Police Gallantry Award Winner from J&K); and the likes that have been on the esteemed panel lending their support and guidance to the torch bearers of a better future of women in India. Talking about the Fair & Lovely Foundation Scholarship program Mr. Arun Srinivas, General Manager Skincare, Hindustan Unilever Ltd. says, “As we enter the 10thyear of Fair & Lovely Foundation, we promise to encourage every Indian girl to make her dreams come true. In the past years we have enriched lives of over 1100 girls and it’s overwhelming to see our scholars carve a niche for themselves in the society with their perseverance and we hope to continue with our endeavor with vigour in empowering the young girls of India”. 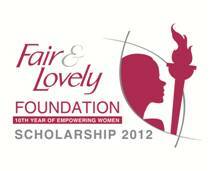 The eligibility criteria to apply for Fair & Lovely Foundation scholarship, is a minimum of 60% in standard 10th & 12th. Applications can also be downloaded or submitted online on www.fairandlovely.in. Aspiring girls can also call on the toll free number 1800 220 130 for more information. The last date for submission of application forms is 30th October, 2012. Fair & Lovely Foundation is an HUL initiative that aims to empower the women of India through education and career development. The foundation identifies academically exceptional girls from financially challenged backgrounds and offers scholarships up to Rs. 1, 00,000 per candidate. To maintain integrity and fairness the selection is done by a panel of eminent personalities from diverse fields. As the foundation enters its 10thyear of inception Fair & Lovely intends to take forward the spirit of this endeavor. The Brand Focus Series – Prakriti Herbals Facial Kit Gift Hamper Giveaway – Winner Announcement! !